Now that you have a basic idea of the business you are planning to launch, it is time to get the specifics in order. Today’s post is all about writing down your business goals and getting a clearer picture of what you want from your business. I urge you to write it all down because it makes things more concrete and establishes the purpose of your business. Before we get to goal-setting, there are two things you need to define first that will ease the goal setting process. For any business to succeed, it needs a vision and a mission. A vision is what you want to accomplish through your business. A mission defines how you are going to accomplish it. In essence, a mission is the cause and a vision is the effect. We’ll take for example, Clothed In Scarlet’s vision & mission statements. I spent quite some time in prayer and discussion with God while working on His vision for this website. I encourage you to confer with God, seek His guidance and then formulate your own vision & mission statements. Make them simple and easy to remember, because they will keep you on track for years to come. Launch website and social media channels within 1 month. Create 20 unique designs and stock the store within 3 months. Achieve $1000 in sales within 6 months. Each of the goals above are specific, measurable, attainable, relevant and had a definite time frame. 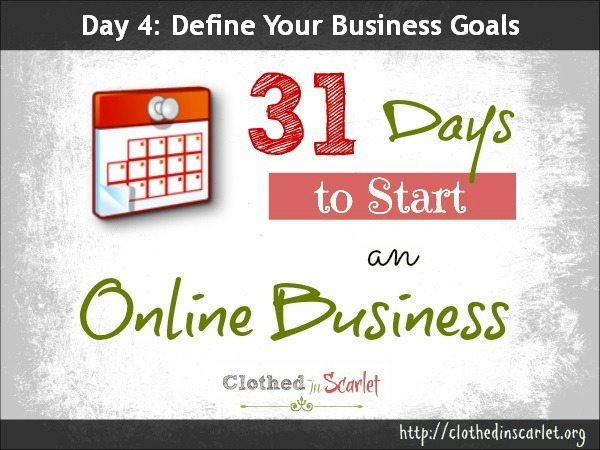 With your mission statement in mind, start creating your own set of SMART goals for your business. I advise you to set both short-term and long-term goals that will provide a road map for your business’ future. What are your goals for the next 1 month? Set up social media channels – Facebook & Twitter. Plan content for the next 2 months. What are your goals for the next 3 months? Reach 100 followers on Facebook & Twitter. Create free product for newsletter subscribers. Send 3 newsletters to subscribers (one every month). Do 1 promotion with free products and discount coupons. Connect with 5 influential people online to get the word of the business out. What are your goals for the next one year? Reach 1000 followers on Facebook & Twitter. Achieve a profit of $5000. What are your legacy goals? Support an orphanage in your city. Giveaway free products/services to people in the lower income bracket. With these questions in mind, set apart a few hours to list down the goals you have for your business. We have created a worksheet for you to write down the vision and mission statements for your business as well as your goals. I encourage you to print it out, fill it up and keep it in a prominent place to remind you of your business focus. Click here to download your free goal planning worksheet. Make a list of short-term and long-term goals for your business.